Cameroon's Christian Bassogog believes Henan Jianye have a bright future after signing a one-year contract extension with the Chinese Super League side. The 22-year-old joined the Zhengzhou outfit in February 2017 and scored 10 goals in his first season. His performances saw him linked with a return to Europe, but he has extended his stay until the end of 2020. "I believe there are successful days ahead and I want to be a part of it," the forward told BBC Sport. "The future looks bright at the club and I want to be a part of it. "I have settled here, I love the people and learning every day, so it was not a difficult decision [to extend]." Bassogog moved to China from Danish club Aab Fodbold after helping his country to the 2017 African Cup of Nations title and had two more years to run on his previous deal. He has scored once in five appearances so far in the 2018 Chinese season. "I am very happy with my decision to commit to the club. There is a lot ahead of us and I hope to make great contribution," said Bassogog. Bassogog started all six games at last year's Nations Cup, scoring in the semi-final as the Indomitable Lions beat Ghana 2-0. 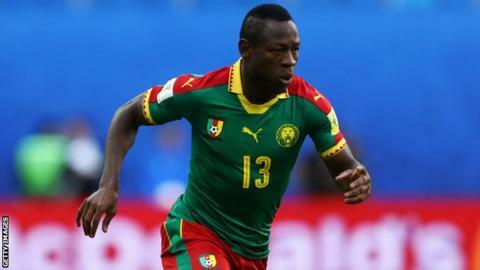 He was named player of the tournament as Cameroon won their fifth Africa Cup of Nations trophy in Gabon. The Cameroonian's football career started with Douala outfit Rainbow FC back home before he joined United Soccer League side Wilmington Hammerheads in April 2015. His performance for the North Carolina-based club earned him a trial at AaB and he was duly rewarded with a four-year contract in August 2015. During his time in Denmark, he scored four goals in 32 appearances for the four-time Superliga champions.